This Vixen Leather Jacket from Firstgear looks pretty darn slick, without being too "girly". Above all, it provides both comfort and style on the road. The leather is mid-weight (0.9mm), though Firstgear includes a removable insulated vest liner for when the weather gets rough. 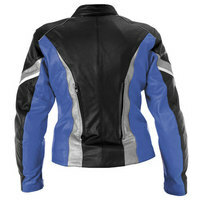 The jacket includes a race-fit tapered body and sleeves and has CE-approved armor in the shoulders and elbow region. The polyethylene foam back pad is perforated, assisting in breathability. There are also front vented panels as well. For even more venting, there are zippers for venting on the shoulders and additional, vertical exhaust vents on the back. Another feature is the 360 degree (ZIPS) jacket attachment system which includes a matching sew-in zipper for your pants. It also includes Heavy-duty, antique nickel, YKK zippers on jacket closure, front pockets and sleeves. There are two inner pockets as well. The premium jacket comes with a 10-year limited warranty for a reliable road jacket that you'll wear for many years.